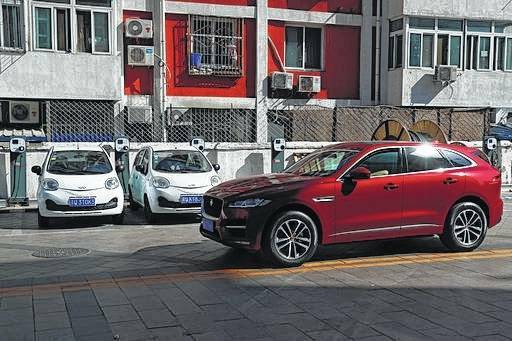 An SUV drives past electric cars parked at a charging station outside a residential building in Beijing. Momentum is building worldwide for electric cars thanks to rising government fuel economy standards and climate concerns. Automakers are jumping on board. But selling those cars will be difficult unless the world builds more charging stations. DETROIT — Around the world, support is growing for electric cars. Automakers are delivering more electric models with longer range and lower prices, such as the Chevrolet Bolt and the Tesla Model 3. China has set aggressive targets for electric vehicle sales to curb pollution; some European countries aim to be all-electric by 2040 or sooner. Take Norway, which has publicly funded charging and generous incentives for electric car buyers. Architect Nils Henningstad drives past 20 to 30 charging stations each day on his 22-mile (35-kilometer) commute to Oslo. He works for the city and can charge his Nissan Leaf at work; his fiancee charges her Tesla SUV at home or at one of the world’s largest Tesla Supercharger stations, 20 miles away. It’s a very different landscape in New Berlin, Wisconsin, where Jeff Solie relies on the charging system he rigged up in his garage to charge two Tesla sedans and a Volt. Solie and his wife don’t have chargers at their offices, and the nearest Tesla Superchargers are 45 miles (72 kilometers) away. The uneven distribution of chargers worries many potential electric vehicle owners. It’s one reason electric vehicles make up less than 1 percent of cars on the road. Automakers and governments are pushing to fill them. The number of publicly available, global charging spots grew 72 percent to more than 322,000 last year, the International Energy Agency said. Navigant Research expects that to grow to more than 2.2 million by 2026; more than one-third of those will be in China. “If the U.S. were to send up a flare that policy was going to change… investments would become very attractive,” he says.